​“Phuket Cooking School” was created for all food and cooking lover. Come and enjoy the full experience of cooking, sharing and learning with us. At “Phuket Cooking Academy”, we pride ourslves on the fact that everyone who enter the kitchen is taught only by skilled and passionate professional. It does not matters if you are planing to cook for yourself, your loved ones, or even for commercial use, at “Phuket Cooking School”, we will give you the knowledge and the skills to truly make things happen! A program has been designed for your need (or could be on your request). A large offer has been put together following an extensive interest survey. Based mainly on the “hands-on cooking experience”, we are confident that your learning time with us, will be remember as a memorable souvenir. ​If you are curious, a fine gourmet, or just a food lover, our philosophy and our determination towards you are strong: to share our passion, our knowledge and our “know-how”. 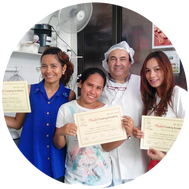 At “Phuket Cooking Academy” we will encourage you to strive for your best so that you can achieve whatever you wish for.